NEW! 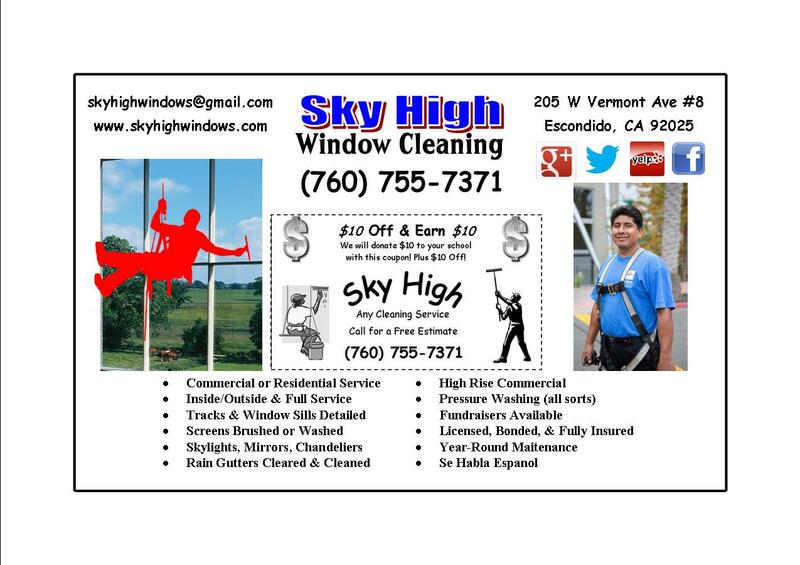 Sky High Window Cleaning Offers Fundraiser’s! All across the nation our schools are facing budget cuts that are devastating our education systems. At Sky High, we believe it is our responsibility to give back to the community whenever we can. We would be proud to assist our community with fundraising efforts. Our Educators rely on donations and fundraising of all sorts to meet their financial needs. Giving back to your community is every citizen’s responsibility. We are proud to be a part of an important community of civic-minded businesses. We hope that our efforts will inspire other companies to donate their time, money, or services. We offer a 10/10 Fundraiser to schools or non-profit organizations. For every new customer who mentions your school’s name we give the client $10 off their service AND we give $10 to their school. Simply contact us with your school’s information and we’ll get you started! Then spread the word! We can help with flyers and emails too!